I’ll be honest. I’ve never been a huge fan of Muscletech’s. Most of their business model is based on shiny packaging and in your face, sometimes questionable and deceptive marketing. But hey we’re kind of used to that in this industry by now, right? Pink Lemonade: Almost everyone has tried a pink lemonade flavored supplement by now- and truth be told they usually all the taste the same. But there’s just something about how this flavor is represented in #Shatter that really got my taste buds excited. First of all it mixes a beautiful shade of pink, and that only adds to the experience. As you know- Im ALL about the total package. The taste has just enough authentic lemony-ness that you feel like you’re actually sipping lemonade. Icy Pink Lemonade was easily my favorite flavor of Shatter. Fruit Punch Blast: “How does pink lemonade and fruit punch make up your top two best flavors? !” you ask, dismayed. Just trust me, is my response. The fruit punch might not seem like the most imaginative flavor profile on the menu- but it really is quite good. If I had to describe the sensation of the taste, it would have to be that of a tropical fruit punch. There are notes of pineapple, cherry, and a hint of citrus that does a fine job of balancing sweet and sour. I’m a big fan of this flavor, and it made choosing between this and the pink lemonade a difficult decision. Blue Raspberry Explosion: The distance between this flavor and fruit punch is very extensive. Whereas my top two favorite flavors of #Shatter were incredibly drinkable and delicious- I was not as enamored with the blue raspberry or watermelon flavors. The blue raspberry was strangely chalky-er than the others, and of course turns your mouth entirely blue. I wouldn’t get this flavor if you’re thinking of buying Shatter. Watermelon Fusion: My least favorite flavor of #Shatter was certainly the watermelon. I just think this flavor has been beaten to death by the supplement companies these days- and they’re really all starting to taste the same to me at this point. This representation is like all the rest. It tastes like old stale, sticky watermelon Jolly Ranchers. No thanks. So that’s what I think of the four flavors of #Shatter- there are some good options for sure, and some of them are (much) better than the others. All four mix very well, and are drinkable- it’s just a matter of picking the right one for your palette. For me, that was the pink lemonade and fruit punch. Ok. So moving on from taste, let’s talk a little bit about if this product actually works! I liked how this pre workout made me feel. I can’t summarize it much more concisely than that! How exactly did I feel? Well, I felt fabulously energized, and surprisingly strong. I took my dosage of Shatter this morning after oversleeping, and feeling sort of run-down in general. The first two days of the week were particularly aggressive in terms of my effort levels in the gym, and I think Wednesday morning was my body telling me that I didn’t have another productive double workout day in me. So what did I do? Prepared to workout, of course. I took a scoop and a half of pink lemonade flavored Shatter, and started preparing for an arm day. Because why not. I figured if I’m going to get just one workout in today- why not make it a bicep day. I slurped down my delicious pre workout, and got into the gym. The workout consisted of my infamous chin-up ladder: A reverse pyramid starting at 10 reps, woking down to 1. The kicker is that after you complete your reps, you hang on the bar 30 seconds. It’s a fantastic workout and my ‘go-to’ anytime I find myself wandering around the gym without purpose. I highly recommend giving it a try next time you’re feeling lethargic in the gym. For the duration I felt like I had superhuman energy- and I think #Shatter absolutely contributed to this great feeling. I didn’t notice a particular ‘pump’ element to the pre workout, but my strength was on-point. I followed up my chin-up ladder with a few drop sets of DB curls just because I still had some energy to burn. This product performed very nicely for me. Let’s take a look at the supplement facts and see if we can determine exactly what’s in here that provides the benefits. I find it amazing that a product with essentially just three ingredients can provide the superb effects that it does- but that just goes to show you that sometimes simplicity can go a long way in these things. In the ‘kitchen sink’ era- it’s actually sort of refreshing to see a more basic formula. In true Muscletech fashion, of course the product contains a few token ‘snake oil’ ingredients as I like to call them. What I mean by that is that they always include a few sparsely-dosed ingredients that have complex, crazy sounding names, but that are usually unproven, and included at such low amounts that they wouldn’t do much anyways. Among these such ingredients in #Shatter is Brown Algae Extract, Holy Basil Extract, and, get this, ‘Grains of Paradise’ Extract. I mean, really? It’s almost laughable. The fact that they even put some of those ridiculous things in here is the main reason why I dinged them on the formula grade somewhat. I’m giving #Shatter an ‘A’ on packaging because it’s SOO Shinnnyyy. The stuff practically flies off the shelf to your hand. That sort of unconscious response to a package is the type of thing that I love. I didn’t even really know what kind of product it was at first, or what it did, but my eye was instantly attracted to it, and a connection was made on an emotional level. That’s pure genius in package design, folks. The product is red, but a holographic red so that depending on how the light hits it, it can light up with all sorts of funky shades and hues. The Muscletech team also knows how to sell you through written text- and there might not be a better example of this anywhere than on the #Shatter front panel. The benefits are clearly laid out for you right on the front, along with the numbers and statistics of how the product an benefit you. Hats off to this package design team for creating a truly beautiful package. I’m giving the #Shatter pre workout an admirable ‘A’ because it tastes great, and provides a rush of energy that I rarely find. The product has a relatively basic formula, but one that is effective at doing what it is supposed to do- enhance the workout experience by providing energy and strength benefits. I absolutely would recommend giving this product a try. 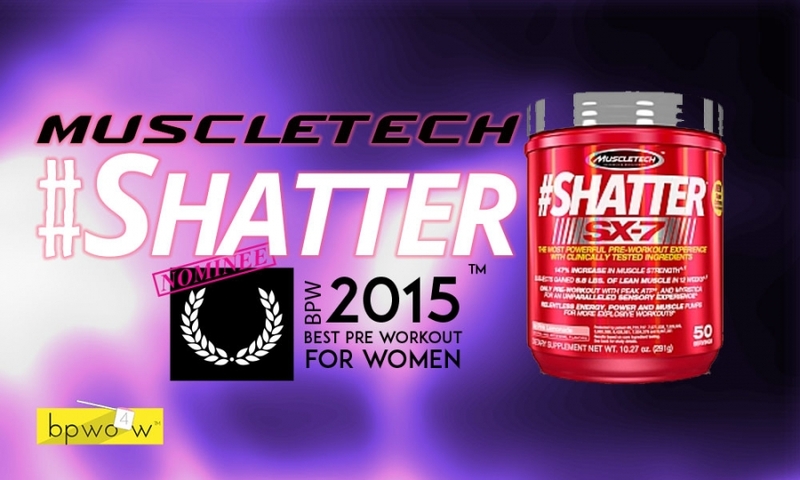 Hope this review of #Shatter pre workout was helpful!